When traveling is in your plans, whether it be a vacation or a move, plans will need to be made for your rabbit. Rabbits have different personalities and each will react in varying degrees to stress, but you should keep in mind that most rabbits are stressed by changes--unfamiliar surroundings, changes in routine, changes in type of food/water, and changes in temperature. Rabbits show stress by getting diarrhea, becoming withdrawn or aggressive, or by refusing to eat. By planning carefully, you can minimize these stresses for your rabbit. If you are planning a weekend trip or an extended vacation, you have several options. a Contact your local House rabbit Society chapter for references. b. Veterinarian technicians at experienced rabbit veterinarians may do pet sitting. c. Look on bulletin boards at vets, pet supply stores, & humane societies, then check references. Your rabbit will be in familiar surroundings. Feeding routine will be closer to usual routine. If you use a veterinary technician or someone who is familiar with rabbits, you can be more confident that symptoms of illness will be noticed. Although pet sitters generally charge more than boarding fees, it can be more cost effective if you also have other pets. Your rabbit is not exposed to unfamiliar animals as in a boarding situation. Your rabbit may get lonely, especially if she is the only animal in the house. Your rabbit may not get out of her cage, if caged. Having a sitter or neighbor who comes only once a day, leaves a lot of time for symptoms of illness to go unnoticed and also makes it harder to maintain some rabbits' routines. If you have other pets such as dogs or cats, provisions may need to be made to make sure they do not bother the rabbit. You may have a friend who will take your rabbit or you may Contact your local House rabbit Society chapter for names of some volunteers who board rabbits. If the person you choose is familiar with rabbits, symptoms of illness may be more quickly recognized. Your rabbit may get more attention than from a visiting sitter. A caged rabbit may get more exercise time than if left at home. Your rabbit will be in unfamiliar surroundings. Other rabbits and pets may stress your rabbit. You will need to move your rabbit's cage and supplies. Ask to see where your rabbit will stay. Ideally, the rabbit should be in a room away from dogs and cats. If the rabbit will be in the "cat room", her cage should not face the cats. Ask if you can bring your rabbit's cage from home. This may minimize the change. The veterinarian or kennel should be familiar with rabbits. An experienced rabbit veterinarian can treat your rabbit should he fall ill or have a chronic health problem. Can be difficult to find a vet/kennel which has desirable space separate from dogs and cats. Kennel staff are not always familiar with rabbits, especially house rabbits. Unfamiliar surroundings and noise from upset animals may be stressful to your rabbit. Your rabbit most likely will not get out of his cage. Kennel staff probably won't give much personal attention other than feeding and cleaning. Can be expensive, especially if boarding other pets also. If you are going on an extended vacation with lots of sightseeing, you would probably do well to leave your rabbit at home. If you are going on a longer vacation of a month or more where you will be based at friends' or relatives' homes, you may be able to take your rabbit. However, you should make sure that your plans agree with your hosts and that there are no allergies to rabbits. Of course, if you are moving, you will need to plan on moving your rabbit also. People have moved rabbits over long distances; It just takes planning ahead. If your rabbit is not used to car rides (except to the vet), start regular car rides as early as possible before your actual trip. Start with short (30 min.) weekly or twice weekly rides in a pet carrier. Try to have some longer rides (1 hr.-3hr.) before the trip. Remember! Don't leave your rabbit in a warm car at the store. If you are moving long-distance and are also moving several animals, you might consider renting a panel van with no partition between the driver and cargo (allows AC/Heat to circulate). Place cages on top of carpet remnants or pads to minimize vibration and secure cages to wall of van. Rabbits like the solid roof. End-opening doors sometimes make it difficult to get some rabbits out; some have doors on the top but these are usually not tall enough to allow many rabbits to sit up. Solid bottoms may make it difficult to maintain a clean area for your rabbit unless you get a large carrier that will accommodates a small litter pan. It is also difficult to attach water bottles and food bowls to doors. Rabbit carriers-Sold through rabbit supply catalogs. These are made of cage wire, sit in a metal tray which holds litter, and have top-opening doors. Small travel water bottles are made for these carriers. Good sources are KW Cages 1-800 447~CAGE; Morton-Jones 1-800 443-5769. A small rabbit cage or your rabbit's regular cage is perhaps the best choice if you will be on the road for more than a day. for hairballs/swallowing of carpet, etc. Prozyme-from rabbit supply catalogs or vet; also keeps stomach flora functioning. May need one for your rabbit if you are traveling between countries or by plane. If traveling between countries, find out ahead of time about procedures at Customs.Quarantines could be a problem. 1. "Tatoo" a telephone number of a reliable friend or relative in rabbit's ears with a nontoxic felt marker. The ink wears off but provides temporary ID. 2. Type short notes for your purse, suitcase, and car giving emergency instructions in case of accident i.e. : phone number of person to call who knows what to do with rabbit and other instructions for rabbit. 3. Take the House Rabbit Handbook and other rabbit health information with you. Contact HRRN for handouts on medical concerns which may also be helpful to veterinarians on your trip. 4. If you need a vet, look for one with experience with "exotics" and ask about experience with rabbits, numbers seen, antibiotics (no amoxicillin/ampicillin), anesthetic (isoflurane is best), and fasting for surgery (no fasting for rabbits). Avoid emergency clinics if possible because they are often unfamiliar with rabbits and more expensive. 1. Look for ones which accept pets. 2. Ask for a room on the ground floor of motels in the back if you are not sure of pet policy. 3. Keep the rabbit in her cage except for exercise in the bathroom. 4. Hang the "Do Not Disturb" sign on the door at all times. 5. It may be risky leaving the rabbit in the motel while sightseeing due to staff reaction and stress of being alone in an unfamiliar place. 1. Explain your rabbit's living conditions before you visit. Will they mind an indoor rabbit? Will there be space for exercising? 2. Ask if they have allergies to animals? People who are allergic to cats may or may not be allergic to rabbits. 3. Be diligent about cleaning up after your rabbit. 1. Rabbits cannot tolerate heat. a Provide wet towels over cage with breeze and frozen water cartons to lie against if you have no air conditioning in hot weather. b. Don't leave rabbit in parked car in the hottest part of the day while you are in a restaurant. You may have to get food-to-go, take food along and stop in shaded rest areas, or wait until early morning and late evening to stop to eat. 2. Rabbits do not like drafts. Carriers should not be placed where AC/Heat blows directly on them. 3. Water bottles will often leak out all their water. Rabbits tend to not drink while traveling. Water should be offered at all stops. Add Pedilyte to combat dehydration but be sure the rabbit will drink it. You may have to syringe/dropper feed water. 4. Rabbits may also not eat while traveling. Offer favorite vegetables, pellets, and hay at all stops. Put some hay and pellets in carrier while traveling. 5. Try to establish some routine. "Imagine being a small animal inside a roaring, quivering airplane for several hours. Your ears may pop, probably for the first tirne in your life. The air on the floor where your box sits is hot and stuffy, or maybe quite cold. When finally let out, you're in a totally unfamiliar place. Ask yourself, is this an experience your rabbit really needs? (B. Woolbright, HRJ, Vol.2, #12). Yes, if it is the only way to get your rabbit to a new home with your family. Perhaps, if you are going on a trip longer than a month. Probably not if you will be gone less than a month. Rabbits who are nervous, fear the vacuum cleaner, tremble in the car, or who are older or have health problems will most likely find a plane trip too stressful. Rabbits who are calm and not bothered by car rides and new places will cope better but may still find planes weird and scary. A one-to-two hour plane trip may be better than a 10-hour car ride. However, four days in a car may be less stressful than an all-day trip of changing planes and traveling to and from airports. 1. Make a reservation well in advance. It will cost approximately $50 regardless of whether your rabbit is in cargo or under your seat. 2. Shop around for an airline which will allow you to take your rabbit, preferably in the cabin. Some allow pets in the cabin, but not rabbits. Most allow only one animal in the cabin per flight. 3. Find out from the airline what type carrier you need. Under-the-seat carriers cannot be any larger than 8" x 17" x 12~ which is too small for some large rabbits. 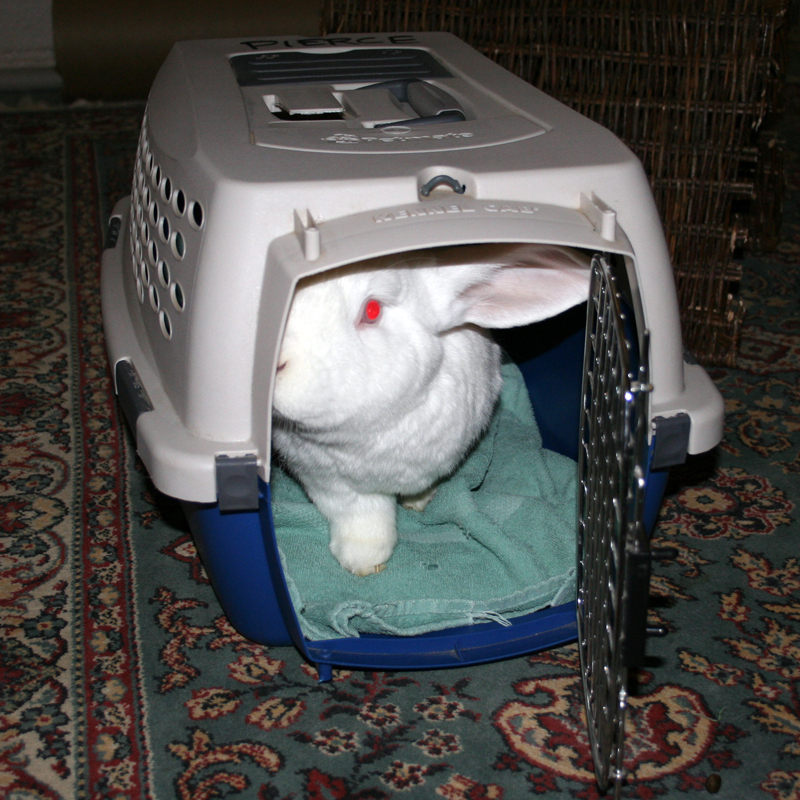 The type with a top-opening door allows you better access to your rabbit. Line the carrier with paper towels or newspapers and hay. Do not take your rabbit out of the carrier in-flight. 4. Take food pellets, hay, and water in your carry-on bag to offer at all layovers. Also take medical supplies and other supplies listed on page 3. 5. Prepare for emergencies (see page 3). 6. Check with the airline on their requirements for a health certificate. You may have to visit an unfamiliar veterinarian before returning home. 7. Accustom your rabbit to travel. Take him in his carrier on car rides at least one month prior to the plane trip. Work up to rides of an hour or more, if possible. Carriers are loaded from baggage carts while engines are idling. People wear earmuffs; rabbits don't. Cargo is pressurized and has limited temperature control, but these are not activated on the ground. Animals cannot be boarded if ground temperature on the tarmac at departure or destination is too hot or cold, so the possibility exists that your rabbit might not get on the same flight as you. Adjusting your travel time to earlier or later in the day according to the temperatures may help. Try to get your rabbit hand-delivered to you and to the plane rather than letting him be put on a conveyor belt or baggage cart. A generous tip to a sky-cap may get your rabbit hand-delivered. For a list of regulations for transporting animals by air which will give you some insight into travel conditions, write Animal Care-APHIS, US. Dept. of Agriculture, Hyattsville, MD 20782.